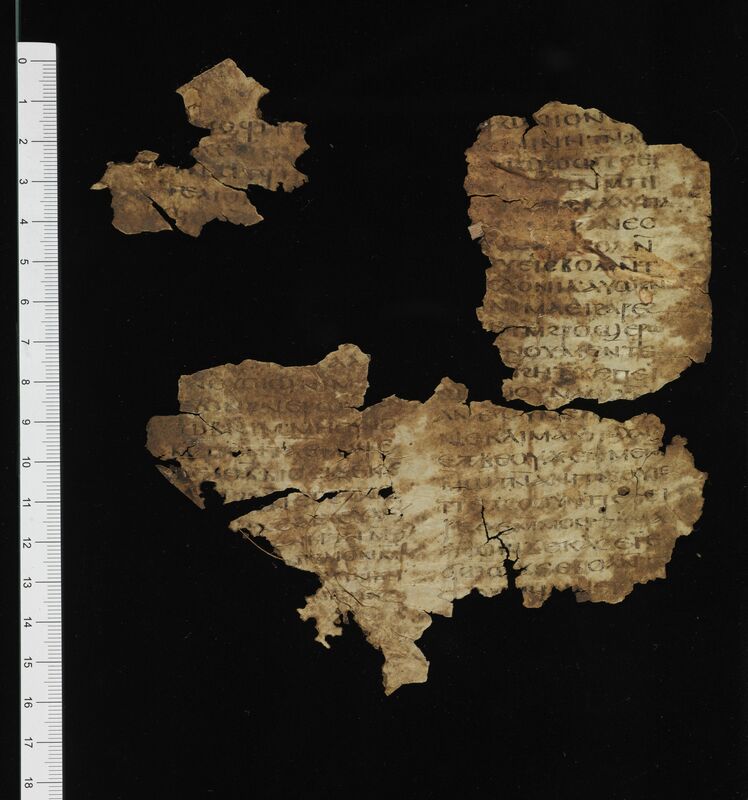 A damaged leaf from a parchment codex containing 2 Corinthians 10:15-11:12 in Coptic (Sahidic). 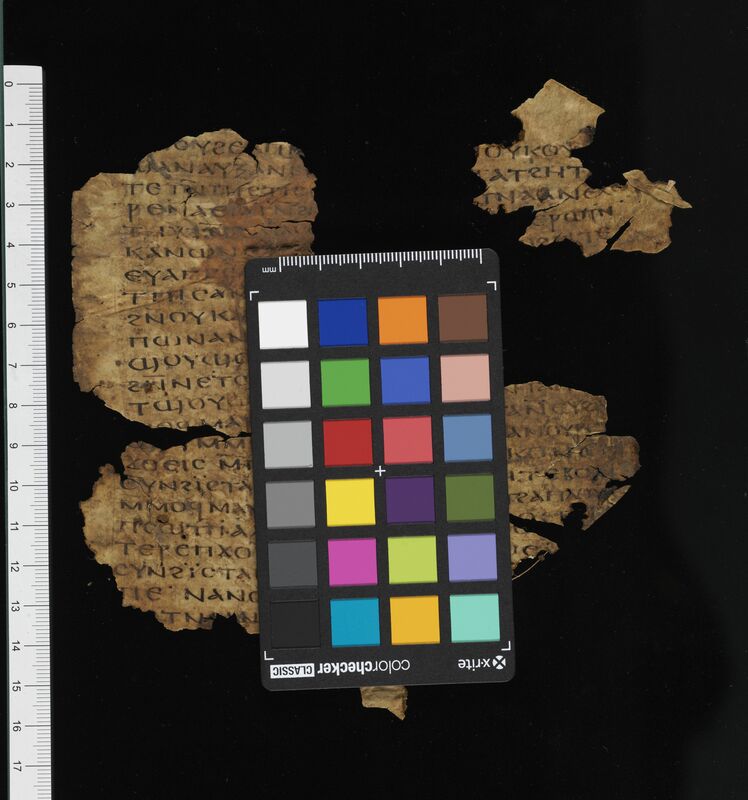 Description: P.Bodmer 42 consists of five fragments of parchment from a single parchment leaf containing verses from 2 Corinthians. Kasser has emphatically stated that P.Bodmer 42 was not part of the rest of the Bodmer find (“clearly distinct in origin from the Bodmer papyri proper,” Kasser, “Bodmer Papyri,” 8.48). Yet, its similarity to P.Bodmer 19 in format, layout, and script suggest a possible association with the rest of the “Bodmer Papyri.” In terms of layout, there is 1.2 cm between the columns. The left margin is 1.4 cm. The right margin is too fragmentary to reconstruct with confidence but appears to be at least 1.4 cm as well. CopistesThe single copyist writes in a script that is at home in Orsini’s “second phase” of Coptic Biblical Majuscule writing. For example, all strokes of the ⲙ and ⲛ are of roughly equal thickness, in contrast to the extremely thin diagonal strokes of these letters found in, for example, P.Bodmer 19. The horizontal bar of the ⲉ tends to be high, and a small ornamental mark appears at the end of thin lines, especially on the left end of the horizontal bar of the ⲧ. ⲣ, ⲩ and ϥ all descend below the baseline. Dimensions: The width of the page is 15.3 cm. The height of the page is 16.0 cm. The ratio of the page (width/height) is 0.894. The writing is in two columns per page. The width of the written area is about 10.0 cm. The height of the written area is about 12.0 cm. There are 24 lines per page on the single extant folio. Paratextual features: There are seven examples of punctuation used to indicate transitions in this text: three examples of a high-dot and four of a mid-dot. 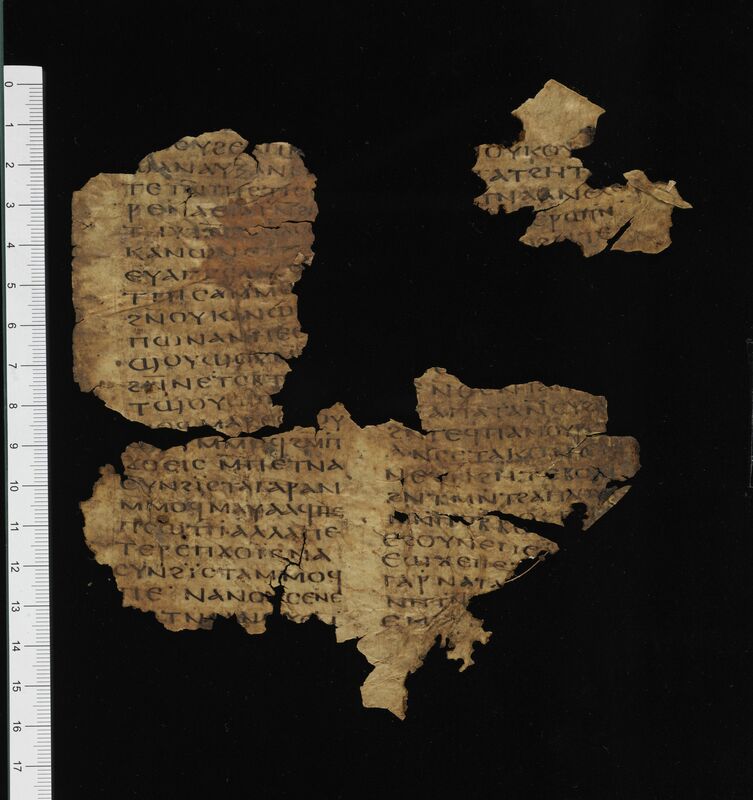 RésuméA damaged leaf from a parchment codex containing 2 Corinthians 10:15-11:12 in Coptic (Sahidic). Sharp, Daniel B. “PB XLII: 2 Corinthians 10:15-11:12 in Sahidic,” Journal of Coptic Studies 20 ( 2018), 177-188.